Although the winner still hasn’t been called in several of Arizona’s biggest races, the inevitable post-election debates and critiques have already begun. For progressives, the most important take-away is this: Arizona is on the right path. We saw some real wins this week, and although there’s still tremendous work ahead, the state is trending purple — in no small part due to efforts to shift the state’s electorate permanently by engaging young people and people of color in the political process. If we want to build progressive power in our state, and want to be the “Big Tent Party”, then we need to have a wide lens that not just includes, but centers people of color. First, we saw historic, record-breaking voter turnout that more closely resembled a presidential election than a midterm. For example, more ballots were returned during the early vote period than during the entirety of Arizona’s 2014 election. There are still ballots left to be counted, but we could be looking at 2.4 million ballots cast, which would be the highest turnout in a midterm election in state history. It could also nearly top the all-time turnout for a midterm election in Arizona, which was 65.1 percent in 1982. According to NextGen America, more than 40% of students at Northern Arizona University voted, more than 30% at University of Arizona, and 30% of students at ASU. Although we’re still waiting to see the final results, compared to 2014, turnout among Latinos was up 43% at the end of early voting, turnout among African Americans was up 53%, and turnout among Asian-Americans was up 74% – outpacing increases among white voters. This outcome would not have been possible without years of hard work to register and engage young people and people of color. The MiAZ coalition and its partners ran the largest field campaign of its kind that Arizona has ever seen, with thousands of organizers and volunteers knocking on an astounding 1.5 million doors in nearly every district across Arizona. MiAZ sent 1.3 million texts, reached over half a million people of color and young people online and garnered 14 million digital ad impressions, all focused on electing progressives up and down the ballot. If Kyrsten Sinema is elected to the U.S. Senate, or Kathy Hoffman wins her state superintendent of public instruction race, the work of Mi AZ will be a large part of the reason why. 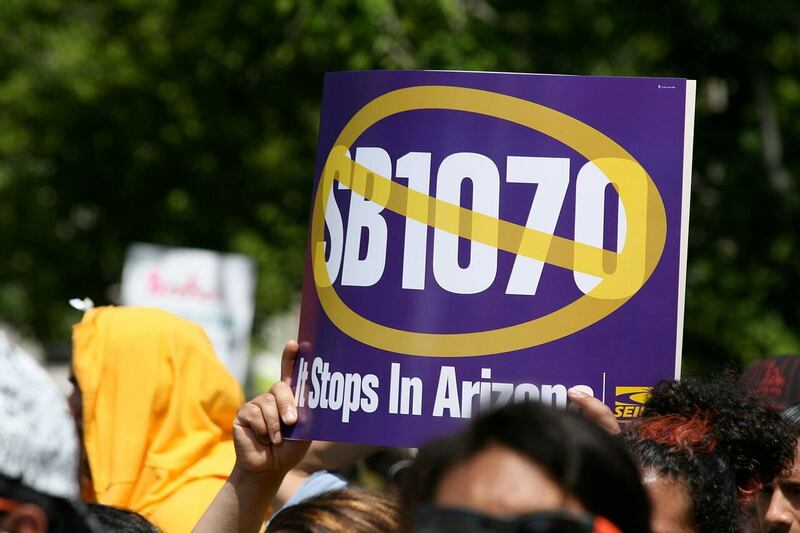 People of color-led organizations set the groundwork for this year’s election back in 2010, when the fight over SB1070 launched a new generation of political leaders. After eight years of hard work, progressives have succeeded in changing what’s politically possible in the state, with Sinema currently leading in the U.S. Senate race and Democrats likely to win Republican-held seats in legislative districts 10, 17, 18 and 28. The Arizona House is likely to be a 31-29 split. That outcome hasn’t been seen in decades, and it’s a game-changer at the Capitol. To get a sense of where Arizona is headed, we should look to Nevada. It took multiple years, multiple election cycles and significant investment to get Nevada where it is now: a purple state trending blue. Nevada has solid progressive infrastructure and strong Democratic candidates using unified, compelling messaging. It also has a massive progressive turnout machine, powered by the Culinary Workers and other labor unions that have invested deeply in field operations to engage and mobilize people of color. According to PEW Research, the Hispanic population in Arizona is the sixth largest in the nation and the fifth largest Hispanic statewide eligible voter population nationally. Trying to change Arizona without listening to or engaging with this community is short-sighted, to say the least. Arizona is going through the same process that Nevada went through before us, and there will no doubt be growing pains. But pitting field work and voter registration against investment in other tactics like progressive narrative building is a dangerous and false choice. We need all these tactics to be fully invested in and fully built out to win in future elections. This year, Arizona had a fully scaled and invested in field and organizing program for the first time ever, one that was highly sophisticated and coordinated down to the last dollar, last door and last hour. Hundreds of canvassers, phone-bankers and texters communicated with millions of voters. That is the reason the U.S. Senate race is so close. We don’t get there without $12 million spent in the field, without organizers and canvassers working for over for over a year to register and talk with every possible voter, and truly engage communities that have never been engaged by progressives. The MiAZ organizations have been doing the hard work of organizing every day in underrepresented communities of color and they are not stopping. People of color and young people have already changed Arizona – and that work will continue next year and the year after that. This election has given progressives the momentum we need to create an Arizona that works for all of us. Change takes time, but it’s clear Arizona is moving in the direction of a place that works for everyone – regardless of who you are, the color of your skin, who you love, how much you make, or where you’re from. Alejandra Gomez comes out of SB1070, trained along with many others to organize the community in building a local non-profit as founding volunteer and staff. She’s now Co- executive Director at Living United for Change in Arizona (LUCHA), which organizes and coordinates many different efforts across a range of issues, including immigration, worker’s rights, living wages, and large scale voter registration efforts. Josselyn Berry is a communications professional with a background in journalism. She is the current Co-Director at ProgressNow Arizona, an advocacy organization focused on promoting progressive issues, holding elected officials accountable and building a progressive communications infrastructure.